Put the file extension in the search, and it will tell us which program to open unknown file extension. Also gives us additional information and links to find the free program if found. OpenWith.org provides detailed information about most file extension and links to free programs that can open and create each type of file. All of us at OpenWith.org have found ourselves helping our parents and friends open obscure file types time and time again, and decided that this information was best shared with everybody. Do you have files on your computer that you don’t know how to open? If so, you need the OpenWith.org Desktop Tool! For almost any file on your computer, the OpenWith.org Desktop Tool will tell you what type of file it is, and show you free programs that will open the file. It will even download them for you! You can simply right click on a file and select "How do I open this?" and the OpenWith.org Desktop Tool will look up the file! 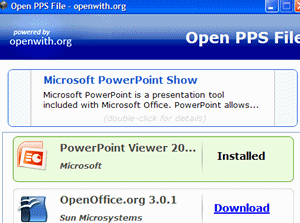 OpenWith.org Desktop Tool is compatible with 98, ME, 2000, XP and Vista.